THE FIRST ORGANIZED FREE CITY TOUR IN BUDVA - every day. MH Travel organizes the first free city tour in the Old Town of Budva! Everyone can participate. Finally, the Old Town of Budva gets the free city tour, and we are very proud to be the first travel company who will put Budva on the list of the world famous free city tours. Budva is the oldest town on Montenegrin coast founded by Theban King Cadmus 2500 years ago. From the very moment of getting the name Butoa up today, Budva has been the most fascinating town in Montenegro. Budva's old town is small and absolutely beautiful, surrounded by beaches, and lovely marina. Today, Budva is is recognized as the most popular touristic town in Montenegro with a hundreds of restaurants, aqua parks, cafe bars, disco clubs, open air bars, shops, beaches and water sport activities. Tour guide has lived in Budva for 25 years and knows the transformation of the town from quiet place up to super modern touristic resort in now days. Number of participants is limited, so hurry and make your reservation on time. Budva Free City Tour is a walking tour.We will inform you about history of the town from the beginning up to present day as well give you tips where to go and what to do in Budva like very usefull informations about local buses, popular beaches, clubs, concerts, or manifastations which are organized daily by Tourist Organization of Budva. The goal of this walking tour is to discover and experience our city through the eyes of insiders, to bring to life streets, squares, churches, beaches and of course, to have fun. The tour ends next to the Slovenska Plaza hotel-beach complex. Our tour guide will take you around the Old Town and show you the most important spots: Ballerina and Mogren Beach, Land Gate, Ancient Necropolis, Square of Churches, Citadel, Njegoš's street, marina, Mediternaska Street and Slovenska Plaza. 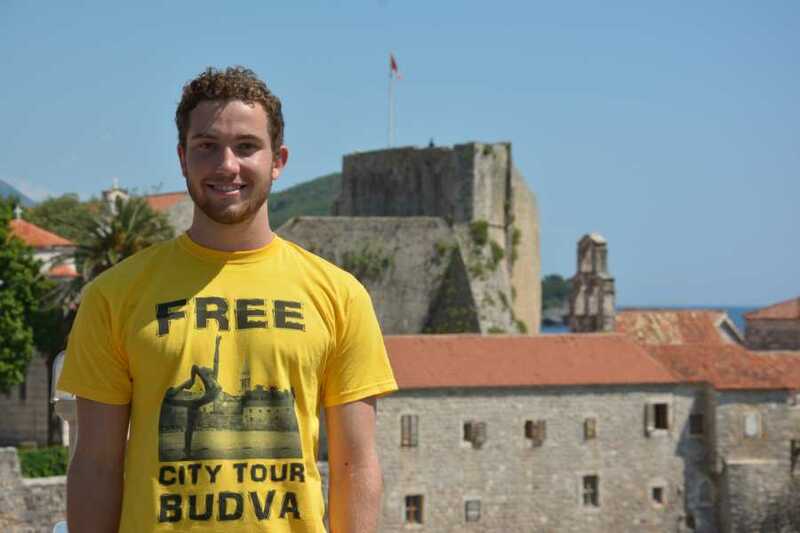 Tour leader as well as promoters have T-shirts with the sign "FREE CITY TOUR BUDVA". Look for us! The cut-off time for the online booking is 1 hour before departure.